I’m thrilled to be heading to Chicago in June speak at the Business Marketing Association’s Annual Meeting. As you can see, the conference theme is to un-learn and empower brands to better adapt to the dramatically changing world of B-to-B marketing. Last fall I was part of a really fun session on CRM integration for marketers with Joel Book (ExactTarget) and Sallie Anthony (Genworth Financial). We’ll be back together for our session in Chicago, where we’ll discuss Direct Digital Marketing (ie. email) best practices. Digital marketing may not be rocket science, but explaining its complexity can make it seem that way. So, I’ll be working with a friend who is a specialist in information illustration to create visualizations of how nearly any organization can personalize their message for 1:1 impact. I’ll post some finalized illustrations here before the conference, so we can incorporate your thoughts. 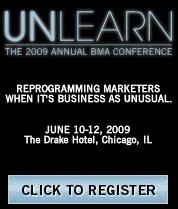 If you’re planning to attend BMA, please drop me a note at <strategy2.0 at gmail.com>. It would be great to cross paths in Chicago. 1 Response to "Heading to Chicago to Speak on Digital Best Practices at BMA"